Mother is such a person who gives you life and devotes herself to your growth. You have a connection with your mom like no other and may want to say thanks to her. 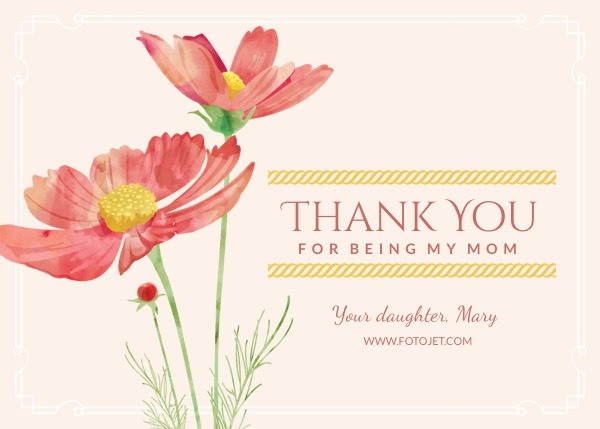 Designing a customized thank you card for mother is one of the most thoughtful ways. This thank you card template with watercolor flower images will give you some creative ideas. This card is ready to use, so you can print it out or send it through email right away. But you can also make your special touch to get printable thank you card by using editing tools to beautify images, style the text, change the background and add more stickers.